This page describes how to install Firefox OS inside a Raspberry Pi running Raspbian, without disturbing the main Raspbian installation. The Firefox-OS-on-Raspberry-Pi project is known by the codename "Foxberry Pi". WARNING: for the time being, this demo software is just that, literally demoware. It has no long-term support plan or API compatibility guarantees, and may eat your homework. This demo is mostly intended for developers who are prepared to deal with bleeding-edge software. WARNING: this guide has you run large amounts of not-particularly-vetted code as root. Please ensure your Raspberry Pi isn't visible to the public Internet and is on a secure LAN. This demo has been assembled from pieces of others' work. Thanks specifically to romaxa, trouch, and Philipp Wagner for doing the heavy lifting! You need a Raspberry Pi, of course. Models B and B+ should work equally well. This guide assumes your Raspberry Pi (here after RPi) is running a recent Raspbian OS. Other distributions will probably work, but haven't been tested. Install WebIOPi on your RPi. Be sure to test that WebIOPi is working correctly before proceeding. This guide assumes your RPi is connected to the host machine via Ethernet. A connection through a wifi dongle or USB networking (or ...) should work fine, but hasn't been tested. This guide assumes your RPi has the default user "pi" configured. You need to know either your RPi's hostname or IP address. The default hostname is "raspberrypi". We'll call this address $rpiaddress from here on. This should create a ffos folder in your RPi's home directory. This mounts a special filesystem on your host machine's $dev/ffos mount point. The filesystem passes reads and writes through to your Raspberry Pi's ~/ffos folder. This allows you to develop code using your host computer's editor and without needing to explicitly synchronize files. This is usually far more convenient than alternatives. Open the file $dev/ffos/app/html/app.js in your code editor on the host machine. If you can't open that file, something has gone wrong in your sshfs or RPi setup. You can of course use whatever pins and elements you wish. However, the demo code assumes the pin configuration above. The push-button switch is the most important element, as we'll see below. Now that your host machine, RPi, and development circuits are set up, you can run the demo. Ensure that your RPi's HDMI out is plugged into a TV or monitor; Firefox OS draws directly to the GPU's framebuffer, it doesn't use X11. So currently the Firefox OS display can't be remoted. Firefox OS runs within a chroot environment within your Raspbian installation. You should see a lot of logging spew written to your console. Finally, Firefox OS will load the demo application. 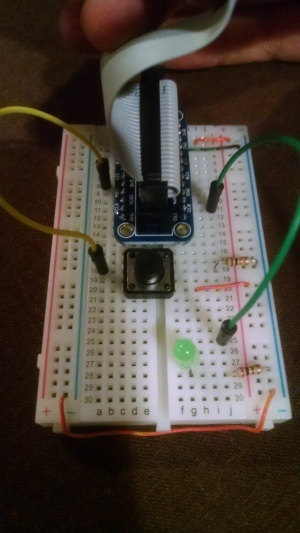 If all goes well, your screen should blink green/black every second, and the LED in your demo circuit should blink on/off approximately in unison with the screen blinking. Finally, return to your open copy of $dev/ffos/app/html/app.js. Find the string 'green' and change it to 'pink'. Save the file. Now we're going to reload the web app. Foxberry Pi has a "reload button" --- the literal, physical button you built for your development circuit! :) Press that button and hold it down for about a second. Your web app should reload and the background start blinking pink/black, instead of green/black. So yes, Foxberry Pi enables save-reload web development on an embedded device. Congratulations! You're ready to develop apps for Foxberry Pi. Follow the instructions here to build Firefox OS (a very old version) for Raspberry Pi. You can also download a pre-built pure-FFOS disk image from that site, if you have no need to run Raspbian. The FFOS-in-Raspbian image hosted on this page was assembled by hand from Philipp's FFOS system image and the Foxberry Pi demo code. This page was last modified on 15 May 2015, at 22:08.